A newly recognized class of disease known as “ciliopathies” has caught the attention of the medical community. Ciliopathies are caused by problems in the structure and/or function of cilia, which are small antenna-like structures protruding from the surface of most cells. The function of cilia has not been understood, but patients with ciliopathies can suffer from a spectrum of problems including retinal blindness, obesity, renal failure, liver fibrosis and mental impairment. Major breakthroughs in the past few years have linked many forms of these diseases with defects in the structure or signaling capacity of the cilia in cells as diverse as retinal, fat, kidney, liver and nerve cells. Because cilia are so widely present on cells throughout the body, many seemingly unrelated diseases are now known to be related through functions of cilia. “We are just beginning to uncover the genetic causes for these disorders, but more research is needed to understand why patients with these particular genetic alterations have such variable diseases,” said Joseph G. Gleeson, MD, professor of neurosciences and pediatrics at UC San Diego and Howard Hughes Medical Institute Investigator, who supervised the work. 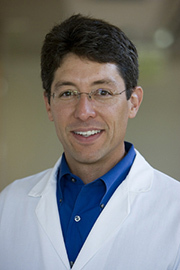 The scientists, led by Gleeson and UCSD graduate student Carrie M. Louie, discovered that loss of the AHI1 gene, which had already been found to cause Joubert Syndrome, a ciliopathy of mental retardation and impaired balance, also caused severe early onset retinal degeneration in the mouse model that they created. This model resembled the most common form of inherited blindness, which is due to degeneration of the retina at an early age. Further investigation revealed that retinal photoreceptor cells in the mouse model were most likely dying as a result of a toxic accumulation of the very photopigment that receives light signals in the eye and is crucial for normal vision. This finding sheds light on one of the potential causes of retinal degeneration, protein mis-trafficking, which has been of fundamental interest in the study of inherited blindness, according to Gleeson. The group then tested whether mutations in genes might contribute to retinal blindness in other related diseases. Their analysis of a group of European patients suggests that this is the case. The scientists found that patients carrying a particular genetic alteration were between five and ten times more likely to have retinal blindness, and that some forms of this blindness may be particularly amenable to gene therapy. Additional contributors to the study include Gianluca Caridi and Gian Marco Ghiggeri of the Giannina Gaslini Institute of Genoa, Italy; Vanda S. Lopes and David S. Williams of the Jules Stein Eye Institute, UCLA; Francesco Brancati and Enza Maria Valente of the CSS-Mendel Institute and G. d’Annunzio University, Italy; Andreas Kispert of the Institute for Molecular Biology, Hannover Medical School, Germany; Madeline Lancaster and Andrew Schlossman of UC San Diego; Edgar A. Otto, John F. O’Toole, and Friedhelm Hildebrandt of the University of Michigan; Michael Leitges of the Biotechnology Centre of Oslo, Norway; Hermann-Josef Groene of the German Cancer Research Center of Heidelberg, Germany; Irma Lopez and Robert K. Koenekoop of the McGill University Health Centre, Canada; Harini V. Gudiseva and Radha Ayyagari of UC San Diego; Elena Vallespin and Carmen Ayuso of the Fundación Jiménez Díaz, Spain, Frans P. Cremers and Anneke I den Hollander of the Radboud University Nijmegen, the Netherlands; and Bruno Dallapiccola of the Bambino Gesù Hospital, Italy. This study was funded in part by the National Institutes of Health, the Burroughs Wellcome Fund, and the Howard Hughes Medical Institute.